The story of the $56 drink. I knew New York was expensive, but this winter we learned that expensive can have a whole new meaning. PB and I have been trying to save money on groceries and going out to eat lately. I realized that I spend way too much money on our weekly groceries, and I am really bad at reigning it in. I still can’t figure out what my problem is, but I think it has something to do with the irresistible treats at Whole Foods each week. The chocolate covered almonds and $4.99/lb fennel get me every time. Anywayyyyyy back to New York. 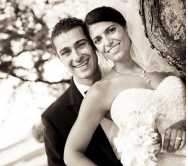 There is always a story after a story, but I rarely feel the need to share it with the world. This one is one worth sharing. Eight of us were out for a post dinner drink at a gorgeous bar found by some fancy Yelp work by PB. The girls had sodas, two of the boys had beer, and the other two (who have been shamed into being nameless) ordered whiskey. Oscar* suggested to Frank* that they order the Macallan, that it sounded good. So both boys ordered it and we all drank away. For sodas, beer, and two whiskeys! 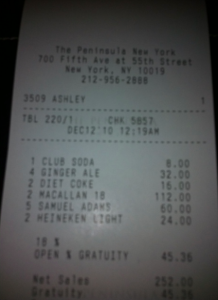 The sodas were a crazy $8 each, and the beer even worse at $12 each, but the Macallan won for the night at $56 a glass! Boys who don’t know their whiskey shouldn’t be allowed to order. Oh my god!!! How old was the Macallum? We have some in our cupboard.. I think the whole bottle was 80$!! That’s crazy! I occasionally go for the 20$ martinis…but 56$ for a few sips? Happens to the best of us!! I think my brother once ordered a 1000$ bottle of champagne. @Gillian, We just laughed about it because they had no idea. If they knew it was expensive and wanted to try it that would have been perfectly fine. We couldn’t stop cracking up all night about it. Was the $1000 champagne amazing and did he order it on purpose? hahah- isn’t that the whiskey they drank on Lost? And the guy talked about how ridiculously expensive it is? I think it is! LOL I totally agree! The scary thing is that it could have been a $300 glass! When I first saw the bill, I thought it was a mistake! Wow, lesson learned, I guess! I also love that a glass of soda was $8! Great post! Yes it was a funny story – gotta laugh that stuff off sometimes! We had a similar experience in Paris–talk about sticker shock! You need to order a few more glasses just to get over the cost…. OMG that’s ridic. Especially since macallan 18 is ‘only’ $120 a bottle. (I say only because it’s absolutely absurd that a GLASS costs half of that). I miss NY a lot, but never will I miss NY prices. There’s a restaurant/bar near where I work that has a “millionaire’s margarita” and one day 2 people order it. The waiter tripple checked told them the price and they said okay. When the bill came and it was $100 each they flipped out and said they thought the waiter was joking!! This little story made me think of that. @Danielle, How do you know the story? Was it your friends or did you work there or???? Sounds silly that they thought the waiter was joking!!! @RhodeyGirlTests, My co-workers had gone for lunch during work one day, and came back with that ridiculous story. I couldn’t believe it! But the restaurant wound up taking them off the bill because they made such a stink about it! I’ve never been so happy I don’t drink; I couldn’t afford it. That happened to my friends in Paris! Their drinks were somewhere around $28 euros and when they were there 3 springs ago, the exchange rate was almost double. At least it was a memorable night! FIRST THINGS FIRST…YOU WERE AT ONE OF THE TOP 5 STARS HOTELS IN THE WORLD…YOU TALK LIKE YOU WERE NOT AWARE OF THAT…..I KNOW YOU WILL BE TRAVELING TO ITALY SOON….BE AWARE THAT ANY “BAR” ON ST. MARK SQUARE WILL CHARGE MUCH MORE THAN THE PENINSULA FOR A SODA…..
Auntie I didn’t even realize we were at the Peninsula until I saw the bill! There was construction all over the outside entrance so there was no sign or anything.. WHOOPS! I remember my first weekend alone in Florence going to Piazza Repubblica for a tea and being shocked that is was 6 euros. That was dumb! Oh man…lesson learned though! That’s incredible how expensive that is! Holy crap!!! Haha please tell my the boys didn’t try to play the “lets split the bill evenly” game!?? 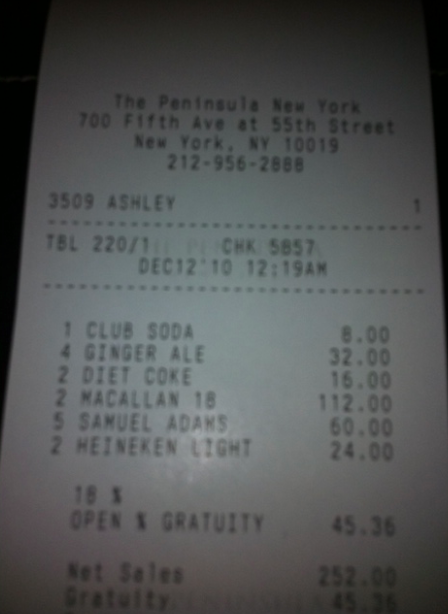 I hope that whiskey was the best they had ever had…$56 a GLASS? oh my god. Oh man! Living in Idaho has spoiled me. Everything is SO cheap here. unbelievable! every bar should be required to have a drink menu with prices. Sometimes all you can do about stuff like this is laugh! Oh god. That reminds me of an almost $400 bar tab for 2 people at Chateau Marmont in LA…fun night, but not so sure it was worth $400! Seriously ridiculous — but even worse $8 club soda, WOW! Hahahaha. The last time I was in Italy the mini-fridge was stocked with 12 euro 8oz cans of Coke. Daylight robbery. I’m the kind of girl who is reluctant to spend more than $10 for a bottle of wine, so… yeah. Yikes. And it’s so much worse if you order it without realizing how much it is. I’m sure they loved it; and are now spoiled for other whiskeys! I was out with co-workers before the holidays and had a similar experience at a champagne bar. I do agree that sticking to a budget can be difficult with groceries. My problem is I always throw an embarassing amount of lettuce away. I am SO bad at checking the produce drawer when making meals during the week. My fiance and I both loved this story!! I was telling it to Joe (fiance) and he was like “oh no they got them the really old stuff!! !” haha. Silly boys. Ouch that is one expensive drink! I’m always nervous when my husband goes out. He’s never come home with a $300 tab, but there have been some $50 and $100 tabs that make me cringe!